Passwords alone are no longer secure enough to protect certain kinds of data. Increased phishing attacks against higher-educational institutions, increases in identity theft crimes, and data breaches on other websites where usernames and passwords may have become exposed all contribute to the need for multi-factor authentication. Attackers will no longer be able to access sensitive information with just a stolen password. That’s where BuckeyePass and multi-factor authentication come in. Multi-factor authentication adds a second layer of security that combines something you know (like your password) with something you have (a mobile device or phone). Beginning May 5th, 2017, users will authenticate using this additional step when logging into the CON Remote Desktop Server. If you plan to use the Remote Desktop Server, please take a few minutes to visit http://buckeyepass.osu.edu to sign up for a BuckeyePass account and enroll a device. When you log into the Remote Desktop Server after May 5th, you will receive an authentication request on your enrolled device to be approved before the login is processed. If you need assistance signing up for a BuckeyePass account, please call (614) 688-HELP. Are you looking for a way to screen your manuscripts and other scholarly works for content that may be too similar to other published material? OSU subscribes to iThenticate, a service similar to TurnItIn that is built specifically for research and other documents that faculty and staff might create. Avoid accidental plagiarism by running your documents through this service provided by the Office of Responsible Research Practices (ORRP). Read more from the ORRP and log in to iThenticate. You will have a manuscript to submit for publication by the end of this summer! Let us know if you are interested in joining the Scholarship Circle this summer. Our College of Nursing Scholarship Circle is shaping up to be an exceptional opportunity for faculty to find inspiration and motivation for creating a manuscript for publication. Cindy Anderson, Joni Tornwall, and Kerry Dhakal are working to build an agenda packed with materials and information that will spark your imagination and make you eager to put words on paper. You’ll hear from guest speakers who have a wealth of real-world experience in nursing scholarship, and you’ll be immersed in a supportive group of peers who will help keep you on track with benchmarks and feedback. You’ll have a manuscript you will be proud to submit for publication by the end of the summer! The Scholarship Circle meetings will consist of 10 sessions over 10 weeks (skipping the week of July 4). They will be on Wednesday afternoons, 1:00-2:30 p.m., in CarmenConnect. Who is the audience for this round of the Scholarship Circle? This Scholarship Circle is for practicing nurses in the clinical and academic setting at OSU who want to publish a scholarly manuscript. 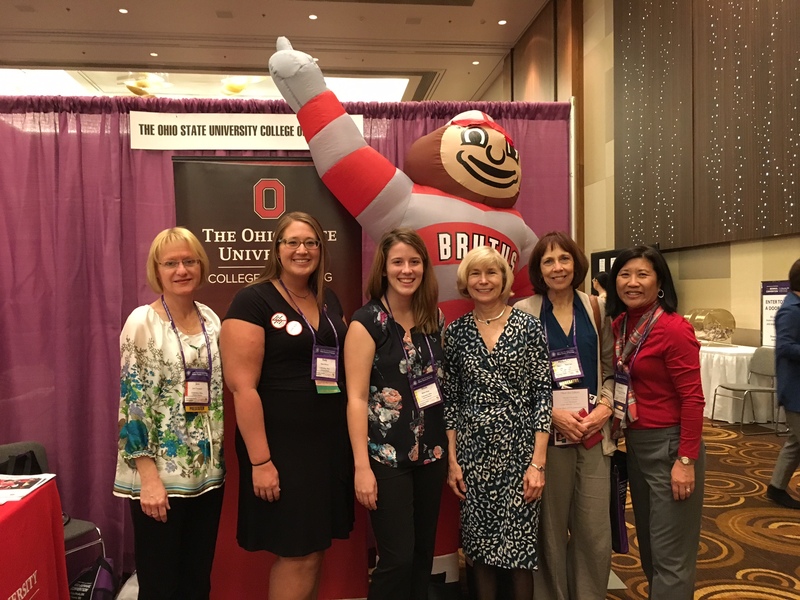 This round of the Scholarship Circle is primarily created for nursing instructors and working advanced practice nurses who are affiliated with OSU. Nine-month faculty in the CON are welcome. Do I have to attend all of the sessions? Will they be recorded? The guest lectures will be recorded, but the segments during which participants are interacting with each other will not be recorded. You do not need to be at all sessions, but attendance will help keep you on track with your writing goals. You will need to commit to writing each week and providing feedback to a peer each week. Does this involve group work? I know what to do; I just need motivation. Yes, you will be working with at least one peer, and the expectation is that you will write something each week to contribute to the group experience. You’ll get feedback from your peers, and you’ll provide feedback also. Group work and exchanging feedback with peers is an important part of accountability to your writing goals. The primary objective is for everyone to have at least one manuscript suitable for submission to a journal or other public outlet by the end of this summer. I may not know enough to join this group. Or, I may be further along in my writing knowledge than the rest of the group. Participants in the Scholarship Circle will have a wide range of experience with writing and publishing. We’ll make a strong effort to pair you with someone who has a similar publishing history as you do and who shares similar goals. Regardless, Kerry (your library liaison) and I will do everything we can to see that you get the feedback and motivation you need. Our guest lecturers will present information that may be new to you, no matter what phase of writing you are in, and Kerry will present information about scholarly metrics that very few people understand well in the context of The Ohio State University. Go to http://go.osu.edu/scsurvey to indicate your interest. You will hear from me (Joni Tornwall) around May 1 with more information about registration and getting started in the Scholarship Circle. You may contact me, Joni Tornwall(.2), with any questions. The following analytics highlight the opening of the semester in January as well as the whole of 2015 and are taken from Google Analytics, Bing Webmaster tools, and our infrastructure logs. The data cover our college website as well as Sharepoint and StudentWeb. * Data for each year is compared to the previous year for its percentage, not to the present year. Our highest traffic day of 2015 was August 25th 2015, with over 2,080 active and unique browsing sessions on our College website alone. Following in a not too distant second was January 2nd 2015 with 1,777 sessions with the amount of pages viewed on the 25/26th of August 2015 being over 10,400. In January 2016, almost 6% of our users were not from the United States. Here’s a breakdown for 2015 and January 2016. In January 2016, we can see a healthy growth of new users, but from an area you might not expect. Holding a slight lead over their younger counterparts, a greater number of new users are 25+ in years of age. More web browsing sessions came from the younger generation, but our newest users were older in age. 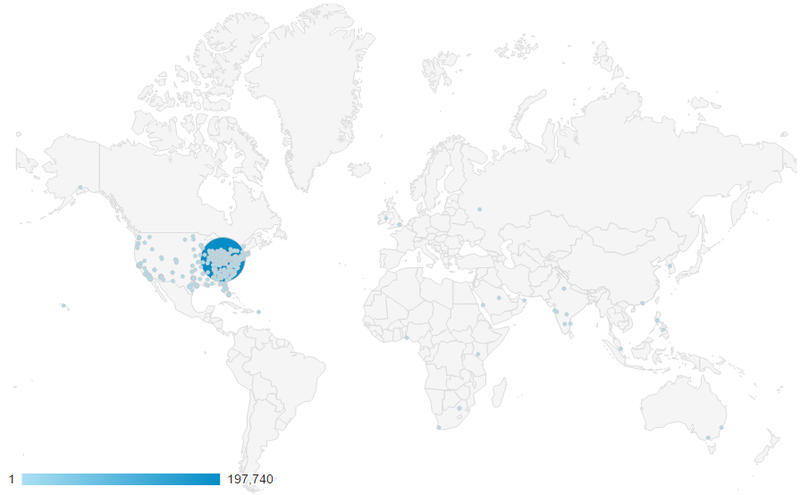 Apple devices continue to dominate our websites, and mobile traffic on our wireless network. 68% of all mobile devices across all websites were Apple products in January, and over 55% of all devices used on our wireless network were iPhones. The most visited area in 2015 for our male users in our Academic Programs was Family Nurse Practitioner, the second was Adult Psychiatric Mental Health Nurse Practitioner. 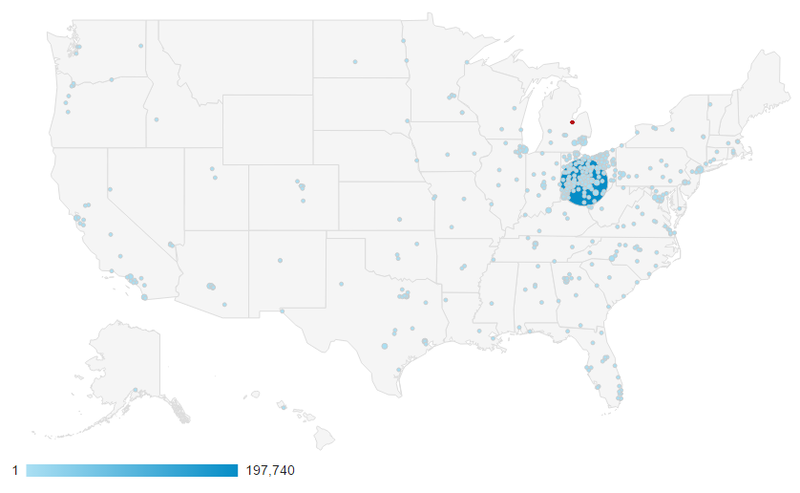 Our biggest advertising achievement of the year was the Welcome To Ohio State’s RN To BSN Option, with 2,362 search impressions (number of times any URL from our site appeared in search results viewed by a user). Facebook led our social network drive with 47.86% of our social traffic coming from the website alone. Rachael Kearney, director of the fully online BS in Dental Hygiene program at OSU, was looking for a better communication tool for her students. They requested an app to communicate among themselves and with faculty, and email or the Carmen discussion board were not what they had in mind. They wanted something that works on their mobile devices where they could follow conversations of interest to them and ignore the others. They wanted instant notifications (unlike the Carmen discussion board) and the ability to respond quickly and simply as they do in a text message (unlike email). Rachel found Slack and implemented it program-wide with channels for individual courses and a channel for the whole program. Students can also chat with each other directly in private conversations. Slack allows sharing of files like PDFs and images and integrates with other applications like Google Drive and Dropbox. Do you think Slack might work for your team or student group? Email Joni Tornwall (.2) for access to a recording of Rachael’s presentation and her slides. If you decide to use Slack with your College of Nursing group, please let me know! We have tech-savvy assistance to support you, if you are interested. Lois is a nurse education consultant and writer extraordinaire who explained that the most important element of a successful proposal for anything is a great idea. Clarify your goals for your project, no matter what it is, and communicate how your project will make a difference to your stakeholders. Take a careful look at what has already been done and written about your idea and get really comfortable with how you can build or improve on that. Create a strong case for the reasons you should be funded/chosen/published. Read and follow–to the letter–the guidelines and requirements! One would think this would go without saying, but many proposals are rejected because simple directions were not followed. Keep your proposal sections within the word limits. Lois covered the common components of a proposal, which are basically a formula for writing your idea in a conventional format. She provided very useful tips for each component; for example, she described how to write a good title for your project and provided examples of good titles and problematic titles. Lois recommended applying for small grants, especially if you don’t have a history of being awarded for large grants or if you are changing your career trajectory. She pointed out that STTI has several small grant opportunities and encouraged anyone who meets the eligibility requirements and has an idea to advance the practice of nursing to apply. Lois kindly gave her permission for me to share her PowerPoint presentation with OSU College of Nursing faculty members. If you are interested in knowing more, contact me, or attend the Flash Friday session I will offer in the spring semester on this topic. 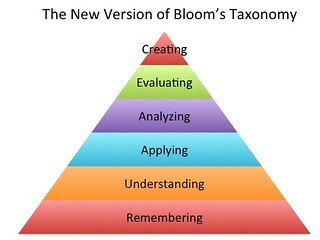 What comes to mind when you hear the words “Bloom’s Taxonomy”? You probably think of the typical pyramid illustrating the stages of learning in the cognitive domain. The most basic level of learning, according to Bloom, is Remembering. As learning deepens and broadens, the student works toward the highest level: Creating. What you may not realize or remember is that there are two other learning domains with their own progressive stages. In the nursing discipline, we sometimes refer to “knowledge, skills, and attitudes,” or KSAs, which align fairly closely with Bloom’s three domains of learning: cognitive, psychomotor, and affective. (See Donald Clark’s website for more information and a plain-English explanation.) In nursing education, we tend to focus heavily on the cognitive and psychomotor domains of learning because that is (or seems to us to be) the nature of our discipline. I was reminded in a session at the STTI 43rd Biennial conference that we need to give the affective domain the attention it deserves and students need. Why does the affective domain matter to nursing? Because when we use phrases like “quality and safety” or “cultural competence,” we are really referring to values that change behavior and affect nursing decisions on a daily basis. That leads to more questions for the educator: how do we assess students in the affective domain? For example, how do we know when a nurse is exhibiting behavior that provides evidence that they have achieved the level of cultural competence expected of them in the workplace? When we write objectives for any learning domain, we look for measurable, observable signs to show stakeholders the objectives have been met. These signs will be products or performances we (as educators) and our stakeholders (administrators, accreditors, students and classmates) can perceive with one or more of our five senses to confirm that a learner has achieved a certain specific benchmark. For example, if the instructional objective is for the learner to administer IM medication safely, it is fairly easy for us to identify the cognitive component of that objective (mental knowledge of medication and technique) and the psychomotor component of the objective (physical demonstration of procedure), but what is the affective part of the objective? It’s an attitude of quality and safety. What metric do we use to measure that attitude? That is the piece that makes the affective domain so difficult. It’s one thing to know the standards by which quality is measured and the procedures necessary to ensure patient safety related to an IM injection; it’s quite another to internalize that knowledge so that it transforms a nurse’s attitude toward medication administration and the whole patient. Verbs such as appreciate and value express the affective domain, but they are not technically measurable. However, it is possible to describe a learner’s behavior when they appreciate cultural differences and value patient safety. They may demonstrate sensitivity to diversity through respectful communication or prioritize elements of nursing care according to changing patient status and safety principles. Writing objectives in the affective domain is a difficult concept to grasp fully. See Donald Clark’s page on the affective domain to get a solid start on making sure you have measurable objectives in all three domains for your class. David Merriman presented a virtual workshop on Friday, November 6, in which participants learned a few tips and tricks in Qualtrics, Ohio State’s new survey system. David has become a Qualtrics pro while working with this versatile and easy-to-use survey tool. He’ll share a few of the truly useful things faculty and staff often ask about, like how to create a scored quiz, email responses to survey creators and survey respondents, insert a customized banner for a survey, and prepare a survey to meet IRB requirements. View a recording of his presentation if you missed it the first time around. 1. You may want your survey to be anonymized, which means all identifying information including the respondents IP address will be removed from the survey. View some simple directions for anonymzing your survey. 2. The IRB may ask you to be sure that your respondents can skip any question they don’t feel comfortable asking (which means any question in your survey). Therefore, you cannot force them to respond before submitting their survey, but to prevent them from skipping a question by accident, you can ask them if they are sure they meant to skip that question by “requesting a response.” Find out how to do that in the Qualtrics documentation. 3. The IRB will want to know what kind of survey system you are using to collect data to confirm that your survey responses are secure and your survey respondents are protected. The College of Nursing has boilerplate language, or a template, to help you describe Qualtrics on your IRB application, and you can find that in the college’s Sharepoint repository. Do you have questions about Qualtrics and how to use it? Please contact David or any one of the CON-IT team members at CON-IT@osu.edu. We look forward to working with you! 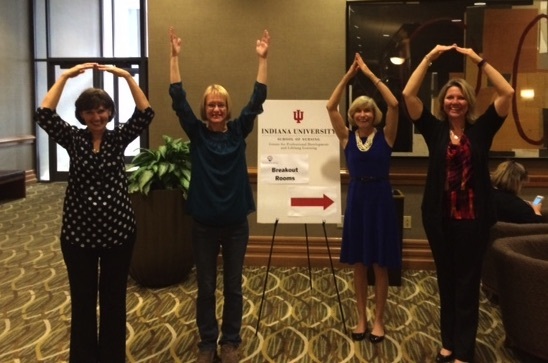 Last weekend, I attended the Professional Nurse Educators Group (PNEG) conference in Indianapolis with my colleagues, Carolyn Schubert, Wendy Bowles, and Lizzie Fitzgerald. Lizzie and I had the privilege of presenting our experiences with student peer-to-peer review for an enthusiastic and supportive audience. I really enjoyed this conference from the perspective of a nurse educator! I am happy to tell you that next year’s 43rd annual PNEG conference will be October 21-23 right here in Columbus at the Easton Hilton! Please consider which aspect of your work with students you would like to present, and I’ll be happy to work with you to prepare your conference proposal. Have a look at the 2015 PNEG conference schedule to find out more about the types of presentations you’ll see at this conference. I’ll keep you posted on the details, and I’ll let you know when the call for proposals is posted. If you would like more information, please feel free to contact me.